THE ENTRANCE TO THE Métro at Porte Dauphine is over one hundred years old, it’s a national monument as well as a national treasure and it’s an iconic reminder of the contribution that Hector Guimard made to the Paris Métro. 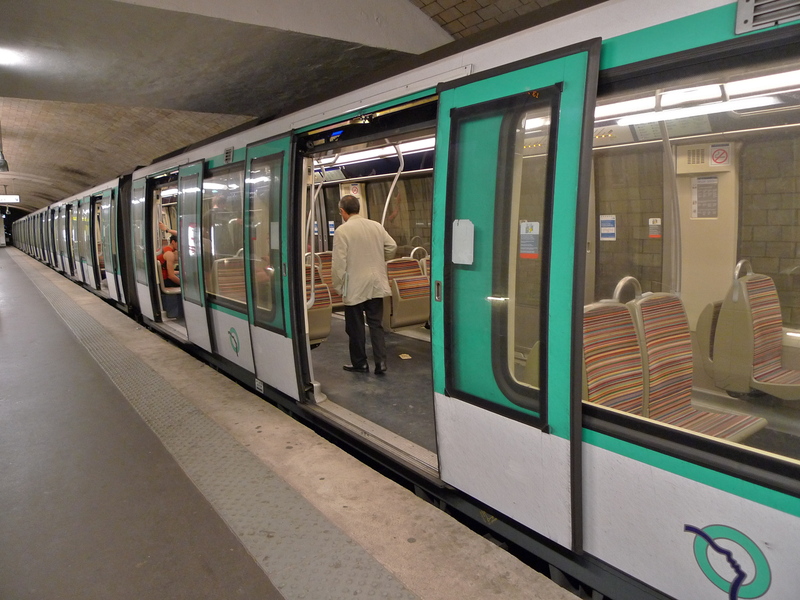 Construction of the Paris Métro began in 1898 with the stretch between Porte Maillot and Porte de Vincennes linking the west to the east of the city. This, with its subsequent extensions, is what today we know as Line 1. At the same time, two other short lines were built both from Etoile station, which we know today as Charles de Gaulle – Etoile. One of these lines went south to Trocadéro where passengers could alight for the Tour Eiffel and the other went southwest to Porte Dauphine and the then fashionable Bois de Boulogne. These lines were later extended with the former becoming Line 6 and the latter Line 2. 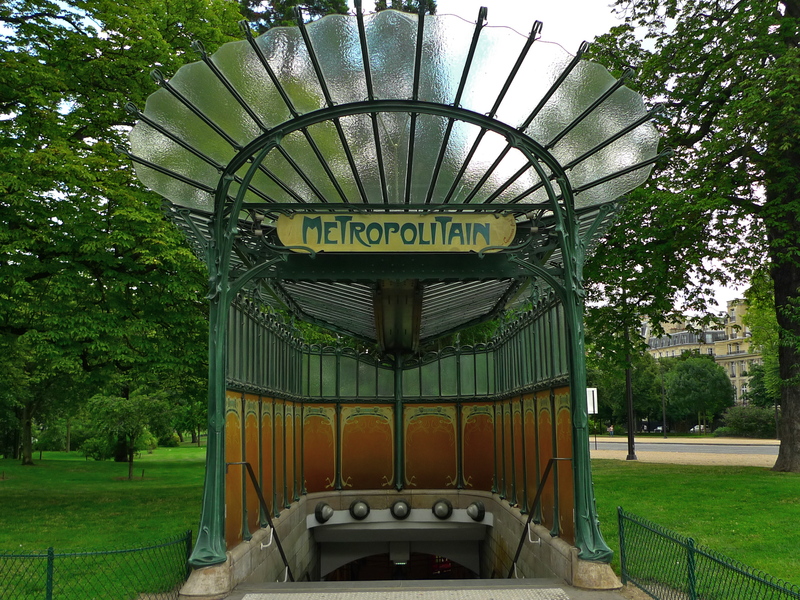 The French architect, Hector Guimard, was just 30 when he was engaged by Adrien Bénard, Chairman of Compagnie du Chemin de Fer Métropolitain de Paris, to design the entrances to the Paris Métro. Bénard wanted the entrances to be subtle and not to detract from the sophisticated Paris boulevards. Guimard’s devotion to the art nouveau style was a gamble but one which paid off handsomely. 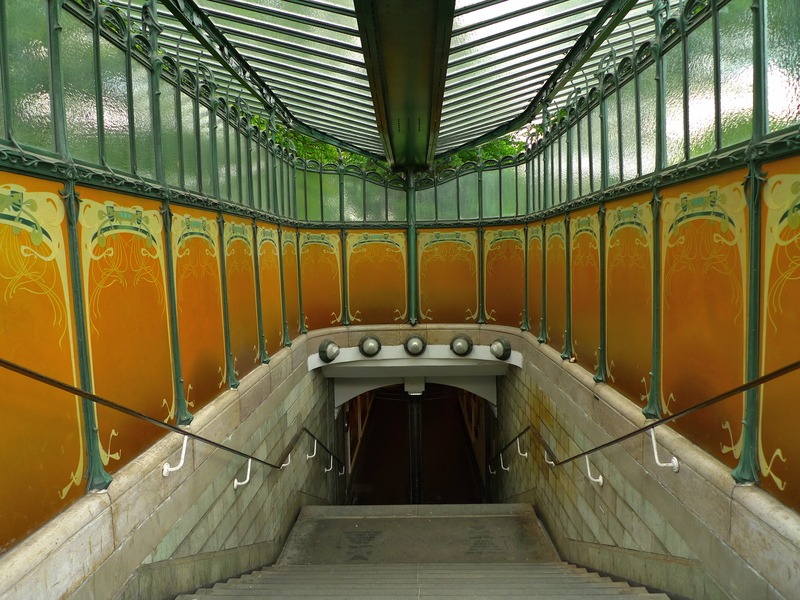 Guimard’s Métro entrances were of two basic types, those with and those without glass roofs. All his entrances were built in cast iron and made heavy reference to nature and the symbolism of plants. By far the most numerous of his entrances were the ‘entourage’ type, shown above, comprising moulded ironwork roughly waist high around three sides of the stairs with no roof. The specification for this type of entrance called for electric lighting to be included and Guimard solved this by placing two lamps on tall support poles resembling plant stems, in which the orange lamp is enclosed by a leaf resembling a brin de muguet, or sprig of lily of the valley. 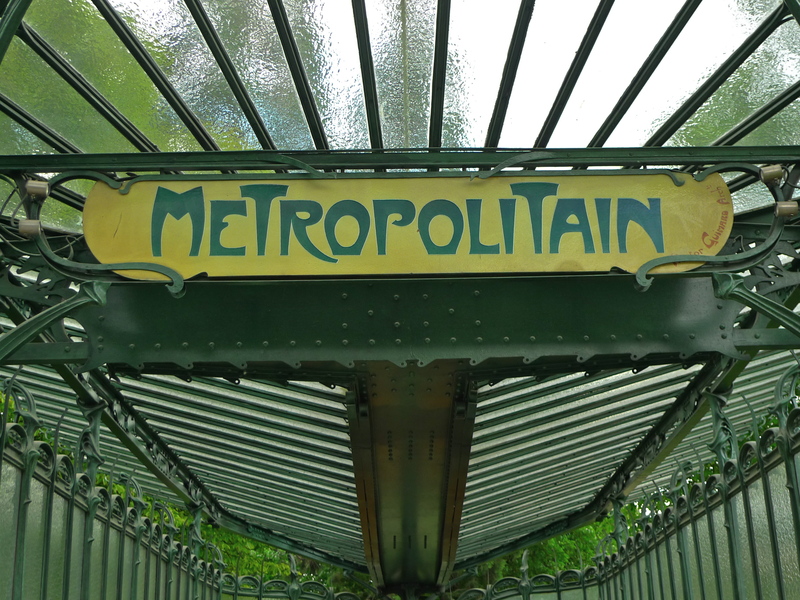 Guimard also included the characteristic ‘Métropolitain’ sign in his distinctive hand-drawn lettering. Interestingly, the placeholders containing the station name and map were not included in Guimard’s original design; they arrived in the 1920’s. Over 150 of these ‘entourage’ entrances were built of which over 80 survive today. 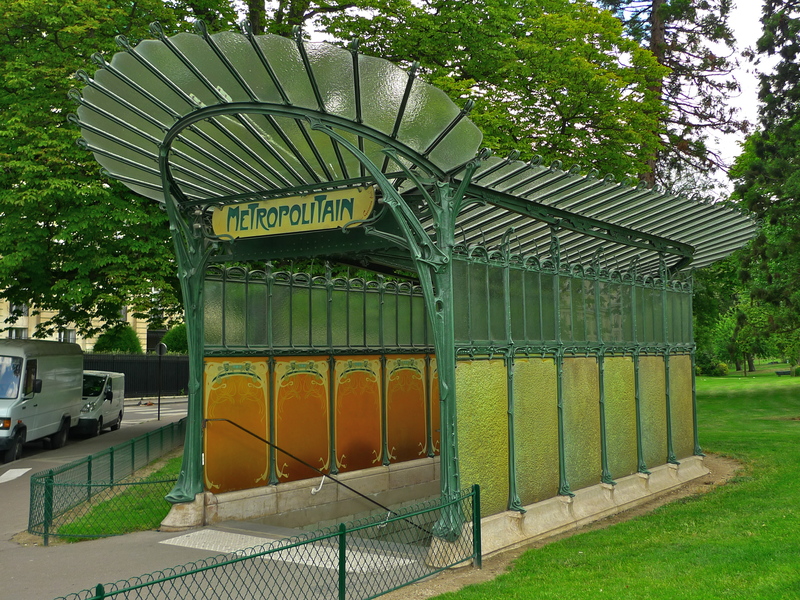 Guimard’s roofed Métro entrances were known as édicules, and they included a fan-shaped frosted glass awning and an enclosure of opaque panelling decorated in floral motifs. 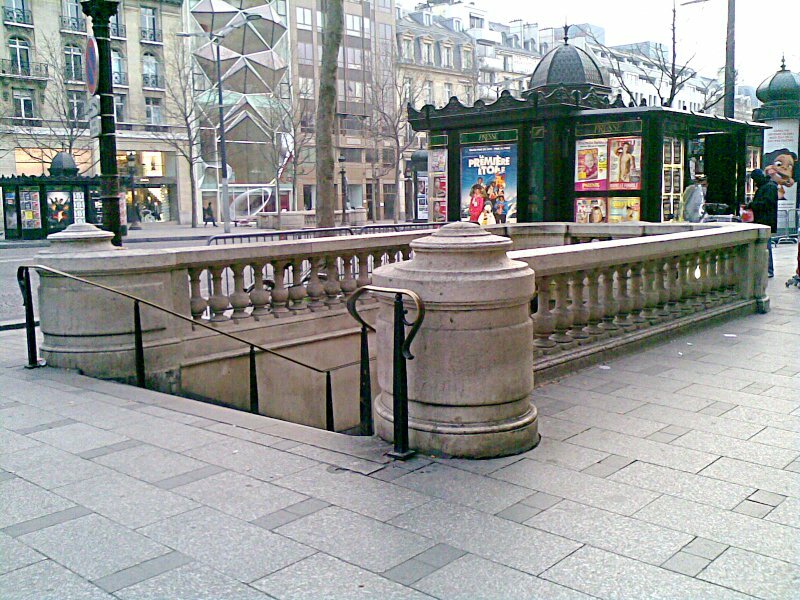 The Métro entrance at Porte Dauphine is an original Édicule ‘B’ design which Guimard installed at three of the first four terminus stations, Porte Maillot, Porte de Vincennes and Porte Dauphine. The one at Porte Dauphine is the only original édicule to survive. It sits perfectly there displaying its organic forms surrounded by trees and with the enormous Bois de Boulogne close by. The panels have had some restoration and they look as good as they day they were installed. 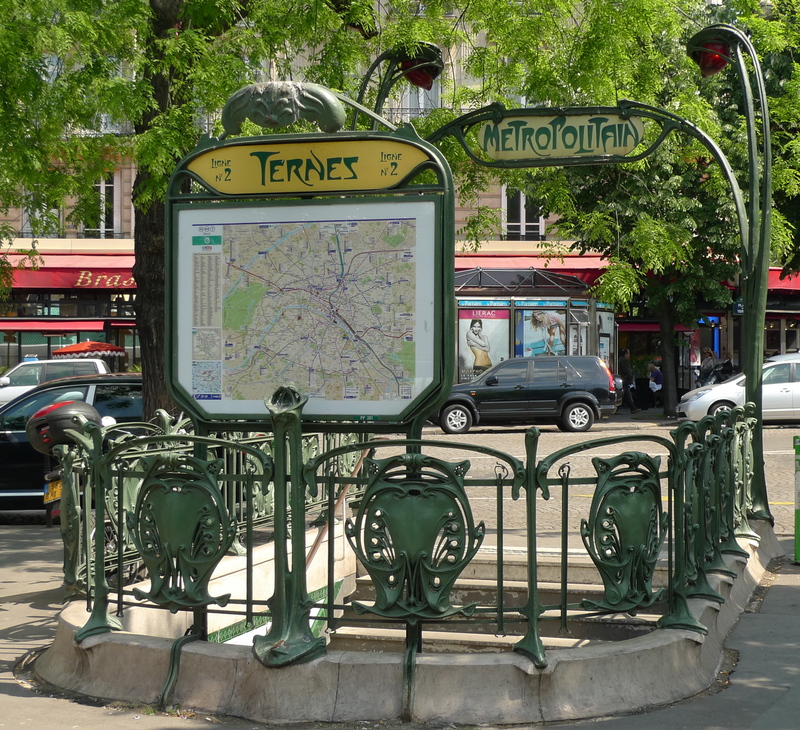 Hector Guimard of course did not design every Métro station entrance in Paris. His art nouveau style was considered too avant-garde for some areas so, in 1904, the architect Cassien-Bernard was engaged to design a number of new station entrances in a rather austere neo-classical style. These can be found in architecturally sensitive areas including the Opéra, the Madeleine and on the Champs-Elysées. It has always seemed a little strange to me that Porte Dauphine should be one of the terminus stations on Line 2. Surely the busy hub of Charles de Gaulle – Etoile would have been the obvious choice. However, Porte Dauphine Métro station may not be the busiest station on the Paris Métro network today but in its heyday it was one of the most fashionable and most popular. Had it not been, it would not have been graced with one of Hector Guimard’s finest creations, which today stands proud as a national monument and a national treasure.